Library Lists allow you to search a category within the library for tracks within a list. In some ways, you can also consider a Library List as a saved search, since it is basically a list of items to search for. 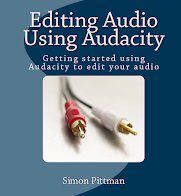 For example, it can be useful for broadcasters who use A, B and C lists, or particular tracks that must be played during particular shows. It can also be useful for splitting a category into diffent sub-categories. For example, if you have a button for music tracks, you can then have Library Lists for the different genres. When you open a "Library List" the category is searched for all tracks contained within the list, and then any matches are displayed. To open a Library List, either middle click a category button, or display everything in the category and then select Library List from the View menu. From the box that appears, select the list you wish to open – any tracks found in the list that are also in the category you are searching will then be displayed. To create a library list, create a playlist and add all the tracks you wish to be in the list (i.e. all the tracks to search for) - you can add items from any category. 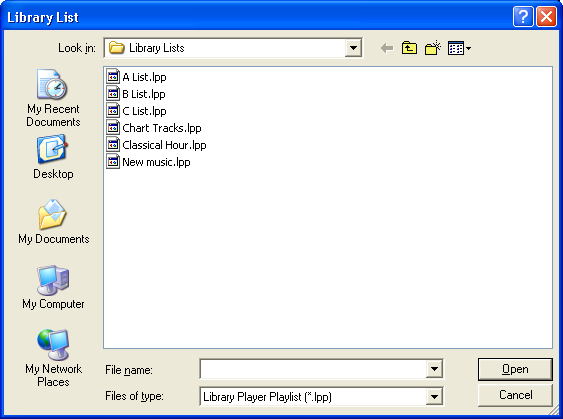 Save the playlist to the folder where Library Lists are usually stored - it will then be immediately available for use. 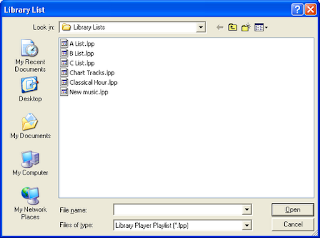 As the list files are playlist files, it is also easy to make changes to the Library List when required.